Paneer Tikka: Paneer tikka is an Indian dish made from chunks of paneer marinated in spices and grilled in a tandoor. It is a vegetarian alternative to chicken tikka and other meat dishes. It is a popular dish that is widely available in India and other countries with an Indian diaspora. Paneer tikka is chunks of paneer, marinated in spices and are then arranged on a stick with capsicums and onions. These sticks are grilled in a tandoor/grill and served hot, seasoned with lemon juice and chaat masala. Chop the paneer in 1 inch x 1 inch cubes. Chop all the bell peppers into 1 inch x 1 inch squares. Chop the onion in 4 equal pieces and separate all the layers og the onions. Keep the chopped paneer, bell peppers and onions aside. In a large bowl, take the curd and whisk it till it becomes smooth. Add in the ginger-garlic paste. Add in the carom seeds, kashmiri red chilli powder, turmeric powder, cumin seeds powder, coriander seed powder, garam masala powder, dry mango powder and black pepper powder. Mix well to make a homogenous mixture. Season the mixture with salt and add in the lemon juice to make a marinade. Add the chopped paneer and vegetables to the marinade. Marinate for at least 2 hours or more in the refrigerator. Remove from fridge and bring the marinated paneer and vegetables to the room temperature. 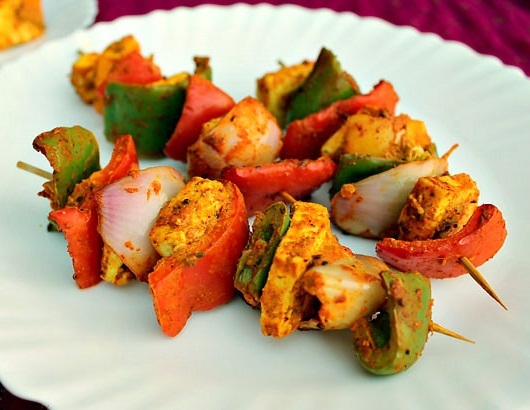 Skewer the vegetables and paneer alternately on skewers or tooth picks. Preheat the grill or tandoor for 3 minutes at 180 °C. On a rack or a plate arrange the paneer skewers and brush some oil on the vegetables and paneer. Bake for 10-12 minutes at 180 °C. Remove the skewers from oven; turn the brush some more oil. Bake in oven again for a further 10-15 minutes. Paneer tikka is ready to be served. Serve paneer tikka, sprinkled with chaat masala, with mint chutney and lemon wedges. If you have any queries regarding the Paneer Tikka recipe, please leave a comment.